Officially Retired. Poppa is a Blue-Ribbon, Generational blue fawn. He is a litter mate to Mercedes who is in our program as well. His temperament is the sweetest, and his athleticism is like no other, which he acquired both from his momma, Maddie. 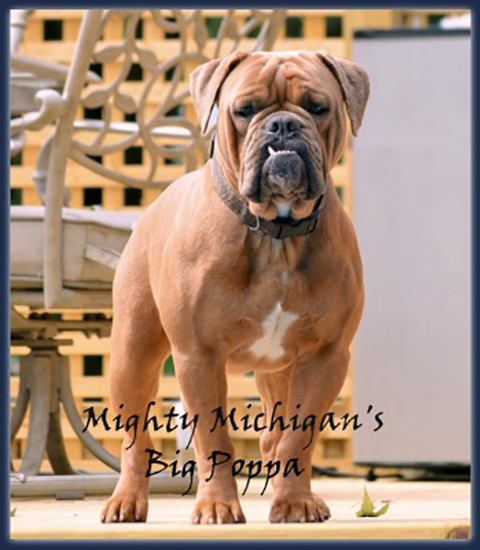 He sired one beautiful litter where we were able to add Cashmere, a second generation Mighty Michigan Bulldogge to our program . BLUE RIBBON BRED.